In our series of Reviews of Gadget MVP Apps we take a look at the I.M.News Gadget By Chris Lang. For those of you who dont know who Chris Lang is let’s just say at this point that he is a well known and well respected Internet Marketer who has been involved in Internet marketing for several Years. He has been a guest speaker at many internent marketing seminars over the years and has on numerous occasions been referred to as “The Nostrodamus of Google”. Chris is well known for his expertise and knowledge about all things “Google” relative to marketing and especially knowlegable about the social marketing side of “google”. Now you may be asking why I have given the long introduction. Well, the reason is that to understand the reasoning behind the App we are reviewing you also need to know a little about the man behind the App to really get the best benefit from the App itself. The I.M News (Internet Marketing News) App uses the “Gadget MVP” Mobile Mini website application system which was researched and developed by Chris Lang and a team of experts in Mobile Marketing and Applications. As with all of the Gadget MVP mini websites it is structured in such a way as to be fully compatible over a wide range platforms including mobile phones, Andriod phones, I-Pads, tablets, Mobile websites, and regular websites. The IM News Gadget is a very popular APP, having been downloaded by thousands of users in a very short space of time. it is available as a free Download on “Android.Market.com“. Once downloaded it opens in a full window and presents itself as a full “mini” website with navigable tabs accross the top bar for easy use. The First tab which opens automatically is the “watch” tab which displays 4 YouTube Videos which are the latest videos produced by Chris for his “followers”. The videos currently on show at the time of this review were on the topic of Mobile Marketing, one of them was a video specifically explaining what his “Gadget MVP” system is all about. You can view that video here. In the video it explains how users can create and manage their own Gadget MVP and get them up and running very quickly on most platforms, and is well worth watching. The remaining three videos which are viewable on the “watch” tab front page are others from some of his marketing seminars and off er tips on Internet marketing and Social Marketing. Apparently Chris Intends to constantly update this series for his App Followers with tips and tricks on best use and marketing tactics with Mobile Phones. The Second Tab on his IM Marketing App is a “Blog” tab. if you click this tab you will be taken directly to his main I.M Marketing Blog feeds. You will see a “scolling” window at the top of your screen which is scrolling through the last few few entries of his Blog feeds. You can stop and read any of these by simply tapping the feed you want to read as it scrolls down. Also on this screen you will see the links to other Blogs which Chris runs on other topics of interest to his Followers. The Third Tab is a “social” tab. This tab is again accessed by tapping the tab which opens a scolling feed to Chris’s main Social sites where he interacts with his followers on a regular basis on sites such as “Digg ” “Google Buzz” and “YouTube”. again you can stop the scroll and tap any of the items of interest and read or even interact on the sites. The Forth Tab is a “Discover” Tab which when opened is an invitation from Chris to join one of his mastermind Groups where he shares and discusses new and interesting marketing tactics with a few select people whom Chris personally vets and selects to join him and the other members of this very exclusive “club”. The Fifth and final tab is an “Alerts” tab where he announces new items and and once again invites you to susbscribe to one of his groups. All in all I found this app to very interesting. I read and watched several of his videos and if Chris keeps updating the content on a regular basis I am sure he will have many more followers and subscribers. I am also sure that his regular visitors will gain lots of useful information from this App and I can highly recommend it to our members here at AppAttract. In todays Mobile World there has been a lot of focus (and promotions) surrounding developing “androids”, “iPhone” and “iPad” applications as of late and to prove my point open up any email which has ‘app’ or ‘iPhone’ in it’s subject and you are going to find more details about the latest “New” Android or I-Phone App which is about to set your World on fire. You certainly are not going to be able to bury your head in the sand for much longer if you happen to be an Internet Marketer. At the beginning of the year one of my internet marketing Buddies “Chris Lang” of “Gadget MVP” proclaimed that mobile apps was one of the main markets he was targeting this year to make money in because he felt that this was going to be the “Big Idea” for marketing in the future, with website being used as the “Backend” of most “apps” rather than as the case today where the website is the entry point, and the website then also being viewable through Mobile phones using various re-direct techniques. This is one of the reasons why he (Chris Lang) invested heavily in his Gadget MVP system in late 2009 and throughout 2010 and 2011 developing and testing the system. The focus as of late for many App developers has been on developing iPhone and iPad apps, but I am still sticking to my guns here and holding up a banner for “Android” as being the clear winner in the ensueing war which is sure to develope this year. Yes, I know, every guru and his dog are screaming from the roof tops to hit the IOS market but let me share with you one sobering fact. Angry Birds is scheduled to hit the $1,000,000 a month mark this year from advertising alone… that’s right. One million dollars a month and the bulk of that is coming from Android. So now that I have set the scene here lets take a look at “Chris Lang’s” Mobile MVP. What exactly is it? and what is it going to do for you. We don’t just make Mobile Apps, we make MVPs (Massive Viral Publishers)…..
Because of all of these integrations and facilities Gadget MVP offers the Mobile Marketer a totally Unique way of getting current and useful information displayed on the Mobile Phones of its users. 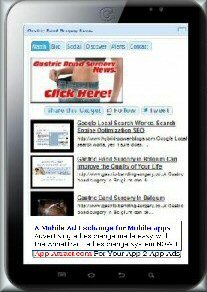 As an example here is a screen shot of one of these Gadget MVP Mini Mobile websites which we here at AppAttract spotted when we did a search in the “Google Gadgets” site. MVP Owners recent Blog entries in rotation. recent posts from his Social sites in rotation. to contact the Gadget Owner. We spent some time checking out the the gadget above and we were extremely impressed with it. It is a fast browser and the links open up fast and all in the correct proportion for several Mobile phones we tested the Gadget on. We can see why these Gadget MVP’s are becoming so popular and we see a great future for them. They offer a far better experience than a normal “Mobile Ready” website and the possibilities for its use are endless. The owners of these gadgets can use them in many ways, but in the example above, a Real Estate Broker, it is possible for the gadget owner to send immediate offers to his clients, display New Listings and even make a short video for clients to view of the latests houses on their list, and all done in just a few minutes. A truly amazing Gadget !